I admit I haven't seen this film in years - since it's not shown much and is not available on Netflix. 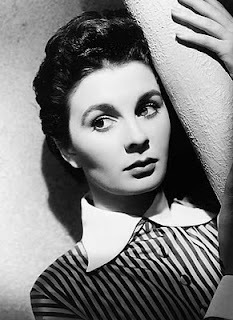 (It's funny how so few Jean Simmons films ARE available.) But I have wonderful memories of SO LONG AT THE FAIR. It was one of the first films I ever saw on our brand new Admiral television way back when dinosaurs roamed the earth. Million Dollar Movie - anyone remember that? On local NYC Channel 11. Then, of course, whenever it came on afterwards, I made sure to see it again and again. It's one of my all time favorite movies. But why am I talking about it when it's so hard to find? Well, it does occasionally show up on Turner Classic Movies and I think it will do so this June, if I'm not mistaken. (June 14th - 9:45 p.m.) So check the TCM website to make sure and note the date on your calendars if I intrigue you enough with this review. It's SUCH a wonderful film. Jean Simmons was a young, incomparable beauty when she made this, one of her first films, starring opposite the equally young and incomparable Dirk Bogarde. 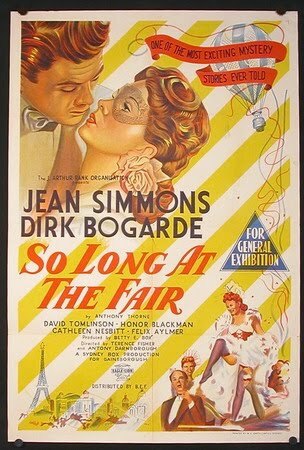 The film takes place during the 1889 French Exposition (Fair) as tourists from all over descended on Paris. Simmons plays Vicky Barton, an Englishwoman just arrived in Paris to see the sights with her brother Johnny. That same night she and Johnny go out to dinner and to the Moulin Rouge, he is tired but game. Later, while her brother stays at the hotel bar for a drink, Vicky calls it a night and goes up to her room. When English painter George Hathaway (Dirk Bogarde) drops off his friend Honor Blackman (young and beautiful, but already possessed of a knowing sophistication that Simmons did not) and her mother at the hotel, he happens to ask Johnny for change of a 100 franc note. Johnny doesn't have exact change but lends him the money for the cab fair and gives George his name and room number so he can repay the loan the next day. In the morning when Vicky wakes up and goes next door to see her brother, his door is gone, the wall is papered and the next door over is a broom closet - if I'm remembering correctly. From that moment on, Vicky's life becomes a nightmare. No one she talks to in the hotel will admit having seen her brother. The hotel manager Madame Herve (an implacable Cathleen Nesbitt) insists that Vicky checked in by herself - there was no one with her. The day porter backs up her story. When Vicky remembers that the hotel maid helped both she and her brother, she waits to talk to her but to no avail - the maid is killed in a ballooning accident at the Fairgrounds. Vicky goes to the police, but they are of no help since the hotel is crowded and no one will admit having noticed Johnny. Since her brother held the money, Vicky is told she must leave the hotel when their two-day reservation expires. Madame Herve gives her a ticket home to England as a 'kindly' gesture. In the meantime, George Hathaway (Dirk Bogarde) has asked his friend Rhoda (Honor Blackman) who is staying at the hotel to deliver an envelope. She slips it under Vicky's door not being able to find Johnny's room number. When Vicky sees the envelope with George's name and address on it, she goes to see him. When George admits having actually seen and spoken to Johnny, Vicky bursts into tears of relief. From then on, once she explains the situation, George is on board to help try and find out what's happened to her brother. After all, who can resist a beautiful damsel in such obvious distress? The film is a suspenseful mystery, but also a gentle romance as Vicky and George work together to find out the truth. The story is told in a very straight forward narrative style which I like. It stays with the points of view of Vicky and George (except for one ominously ringing hotel bell) and doesn't wander all over the place trying to 'broaden' things. Though the surprising denouement does have 'broad' implications, the story is really rather a simple one. It is a purely wonderful movie of the kind that they, unfortunately, don't make anymore. God only knows what they'd do to this if they were to re-make it today. I've not seen this, but I sure would like to. Every time I read about this movie I am reminded of a great book I read a while ago. The End of Her Honeymoon (1913) by Marie Belloc Lowndes has a very similar plot. Only difference: the brother is the woman's husband. And later I learned that there are numerous books that use the same plot. In fact it has turned into an urban legned thanks to Alexander Woolcott who claimed it was a real incident that was published in a Deteroit newspaper. He wrote about it in When Rome Burns. This led to an interesting case of plagiarism. Australian crime writer Kerry Greenwood came across Woolcott's book, saw the story and thought she could turn it into (yet another) mystery story. It was published and she was accused of stealing the plot from the movie you review here. Greenwood claims she never heard of the film and talked of Woolcott's story as her inspiration. And there's your trivia overload for the week. Use it wisely! I've actually seen this one. It was on TCM a month or two ago and I had it on my DVR. I watched a few days later and really enjoyed it. This is why I visit this blog. A movie I've never seen but would now like to, and a fascinating bit of trivia. What more could one want? John: Yes, I've seen variations of this plot myself. Never as good as this movie of course.I purposely didn't talk about the smashing ending in case someone hadn't seen it. But boy is it a doozie. Ryan: It was probably on for Jean Simmons day when she passed away a few weeks ago. Maybe it's not going to be on in June. I'd better double check. I'm so glad you enjoyed it! Carol: Yes indeedy, we aim to please around here. HA! I know the film is available on dvd for sure. One of these days I'm going to break down and buy it myself. Thanks for dropping in AND the kind words, Carol. You're a peach. Thanks for this review. This sounds like it's up my alley moviewise, and I love Jean Simmons -- saw her recently again in Elmer Gantry. But did the director have to name Honor Blackman's character Rhoda? It doesn't fit; it should be Genevieve or something lovely. I've never seen this one but I do love Jean Simmons. I'm going to have to check out the local listings for TCM and make a point to watch this! My library doesn't have this, so I'll have to look for it elsewhere. Meanwhile, there are several films with Jean Simmons acting in them. Lisa: June 14th, far as I know. Don't miss it! TCM on June 14? Well, I have Turner Classic Movies, so if this runs there, I can see it, unless it's at an inconvenient time. There's also Elmer Gantry, which I saw again recently. Re: TV: The U.S. version of the Danish thriller, The Killing, has been on AMC for two weeks on Sunday night; it's a weekly serial, takes 13 weeks to solve a murder. It's good, unassuming, modest, but smart woman detective. Kathy: I don't have cable, so any tv I see has to be on my computer. This new series will probably show up there sooner or later. I've heard good things about it. AMC now has episodes of The Killing at their website.